You’re about to see Mike Caro’s biggest money-making poker tells come to life in a spellbinding hour-and-a-half of dramatic world-class instruction. 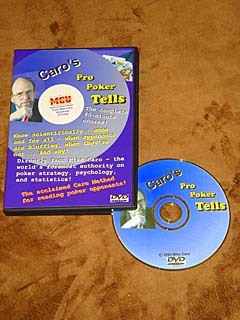 Each tell, carefully portrayed by serious and professional poker players under Caro’s personal direction, pops off the pages of the original classic Caro’s Book of Tells — The Body Language of Poker. You’ll see players in the very act of giving you the clues to easy profit. Betting motions that let you know when opponents hold strong hands and weak hands. See the dead giveaways that show you whether your opponents want you to fold or call — so you can disappoint them! Find out whether players waiting to act after you are likely to fold or pounce. You’ll understand these powerful tells immediately and be able to apply them in every game, at every table, whenever you play poker in the future. It’s often as if your opponents had turned their cards face up on the table! See the live action that demonstrates when opponents are bluffing and when they aren’t. And understand the reasons behind their actions once and for all. Mike Caro’s breakthrough video not only shows you what opponents hold by their actions, but he explains what they’re thinking as they’re doing it! A remarkable course in reading opponents, complete with freeze action and full explanations from Mike Caro. This incredible DVD brings these common tells to life makes it easy for you to recognize them in your next poker game for real money!